This tape features flat 20 Hz to 20 kHz frequency response, low noise, and good output levels. Note that your tape recorder must have a Type II record bias option to utilise these tapes properly, otherwise you must choose special Type II cassette shells to ensure you record with the proper EQ curve on this type of tape. If this does not suit you, see our normal bias cassettes for music-grade tapes that will work in standard recorders. 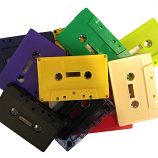 We custom-make these tapes to your specifications in length and shell colour.